The Amours recount two of Ronsard’s love affairs: the first with Cassandre, the second with Marie. Cassandre is said to be Cassandre Salviati (1530-1607), daughter of an Italian banker, whom Ronsard met at a court ball on 21st April 1545, when he was 20 and she was 15. As a man of the church, Ronsard was unable to marry; but it clearly didn’t stop him falling in love…! She features in the Odes, published in 1550, before getting her own volume, book 1 of the Amours, in 1552. 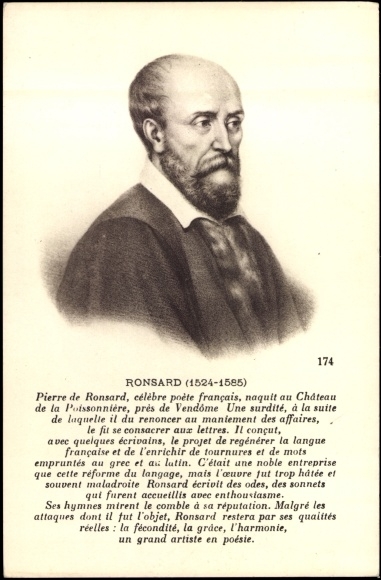 The Cassandre poems are almost all in decasyllabic lines, show very little variation in metrical form, and in them Ronsard is keen to develop French poetry along classical lines with plenty of mythological allusions and a ‘high style’. Marie was youngest daughter of Étienne Guyet, a minor noble; though she did not return Ronsard’s love and married another, her early death in the early 1570s brought a wonderful series of sonnets from Ronsard, more sombre in tone than the first half of the book but balancing it in their elegance. This volume came out in 1556; its continuation in 1574. The Marie poems are more heterogeneous than the Cassandre set, and in fact the collection as represented in the oeuvres complètes was built up from several independently-published sets: in these poems Ronsard has developed his view of French poetry, and now favours the alexandrine (12-syllable line) as being ‘more French’, as well as introducing more colloquial, day-to-day vocabulary and more exclamations, terms of endearment etc into the poetry in place of the earlier ‘high style’. In the 1570s Ronsard returned to the theme of love and the form of the sonnet, with two books of Sonnets for Hélène. By contrast with the earlier love affairs, this one with Hélène is, as far as we know, a ‘courtly’ love although Hélène herself was real. As well as these books, Ronsard also published the “Amours Diverses“; and on top of that made many changes, additions and subtractions in later editions of the Amours. Many of these have conventionally been collected into the “Recueil des Pièces retranchées des Amours” (‘Collection of pieces withdrawn from the Loves’).